Cool, gloomy weather is characteristic of winter, which begins this month. Many of the problems that surface in late winter or early spring in greenhouses can be avoided now with just a little effort. Bacteria and fungi thrive in the wet, cool conditions of winter, but are vulnerable to simple sanitation procedures. Brown spots on flowers (Botrytis) and soft wet spots (Pseudomonas) on leaves that spread and kill small plants if untreated can be avoided or, at least minimized with good sanitation. Clean all non-growing surfaces with a 5% Clorox solution. Walkways, concrete surfaces, and even walls can be safely cleaned eliminating spores that can be a problem later. Avoid getting this solution on clothing and plants as it will bleach plant materials. Alternatively, you can also use Physan that is approved for sterilizing surfaces. Physan is relatively inexpensive and available. There are different formulations for treating surfaces and plants. Physan is a surfactant and keeps water from standing on surfaces and leaves of plants. If you have thin-leaved phals or other sensitive species use the recommended formulation for plants at half strength. Also spray before the greenhouse gets hot. Spray bench surfaces, sides of pots containing plants, and even walls of greenhouses with the formulation specified for plant application if the product is likely to get on your orchids. If you have problems with water condensing on the ceiling of your greenhouse and dripping onto plants, spray the ceiling as well. The idea is to kill as many of the spores that float around your greenhouse so they will not begin to grow on plants. Be sure you clean all dead plant materials from under benches, in pots, etc. That includes soft bulbs or leaf material. Hard brown plant parts can be left alone. This is a good time to survey your plants and space them so that leaves are not touching each other and will dry quickly. In summer, you increased air circulation to prevent overheating, now, do the same to help leaves dry quickly and prevent spores from beginning to grow. It is now more important than ever to water early in the morning on days when your greenhouse will gain enough heat to vent and pull in fresh air. Your goal is for all plants to be dry by nightfall when temperatures drop in the greenhouse. Are there drip spots in your greenhouse? Most greenhouses will have places where condensation drips from the ceiling and rafters. Check plants below and arrange them so the drips are not falling on leaves or sensitive buds. This is especially critical for phals and paphs. Conversely, I put phrags and dendrochilums that have suffered all summer in my hot greenhouse directly under these drips and they thrive as long as they are in well-drained media. Generally, though, avoid drips on plants. What temperature is best for orchids? This is another commonly asked question. Phals should be kept at a minimum 65 F to avoid problems. The key for phals is to keep them growing, which tends to stop when the media and roots get below 65 F. This is also the point where Botrytis begins to grow. Vandas and ascocendas also like 60-65 F as a lower temperature limit. Standard cattleyas and paphs tolerate 55 F or even a few degrees cooler with no problem. Lower temperatures mean that your orchids will require less water on these short days so adjust watering appropriately. This can be especially difficult for phals and paphs in soilless or dense media as they may never dry out. Many phals drop flowers and buds prematurely in spring because they lose their roots to over-watering in early winter. Indoor growers have different problems and solutions depending on their growing situation. Heaters operating in living areas lower humidity. This requires an increased frequency of watering: the opposite problem experienced in greenhouses. If your orchids are totally dependent on sunlight coming through windows, low light levels and cold spots can also cause problems. Tape bubble wrap to windows, which limits cool spots and diffuses light that can burn leaves. Humidity can be increased by placing fine sand in a shallow tray and placing each orchid on the sand. Sand has lots of surface area from which water evaporates. Add water when the sand starts to dry. Each successful indoor grower has developed their own technique specifically suited to their situation. Indoor growers, lucky enough to have full spectrum lighting, have an easier time in winter as they can control light levels and the excess heat from lights is an asset. Humidity problems are now the major problem, but not much different than in summer when air conditioners were causing the same problem. Under light growers may need to stimulate spikes by lowering temperature or changing day length if this has not been done already. 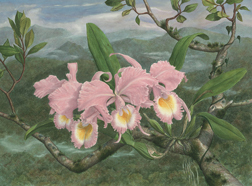 Duplicating seasonal changes of the tropics is not necessary as long as the orchid experiences an environmental change that stimulates flowering and growth. Learning how to do this is not hard, but does require some trial and error-type experience.